A lot of raffle items, including a $5600 rolling tool chest from Snap-On tools. A number of vendors will be on site including Custom fabrication, paint, and chrome shops. Many incredible bikes on display in the show. Lanphere’s is offering up inexpensive Dyno runs for the event; check out your bike’s horsepower and torque, and identify any tuning problems for only $25! It’s free to come out an wander around and look at the bikes, vendors, and eat the food. But, you might want to bring some cash to enter the raffle or bid on one of the many gift baskets being auctioned off for the Candlelighters charity supporting children with cancer and their families. 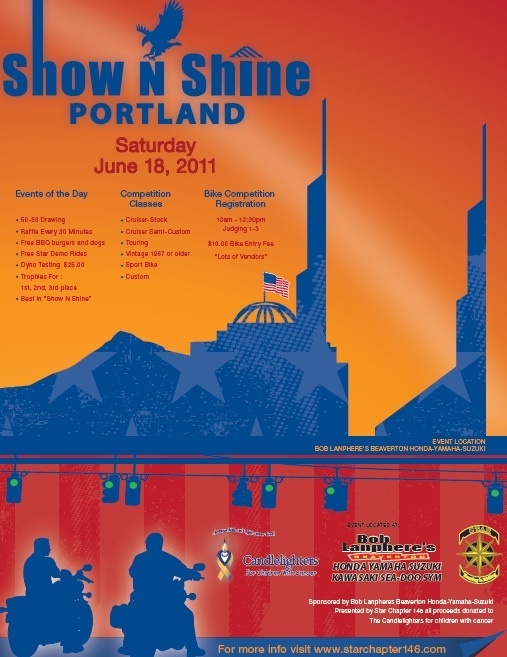 You can also support the charity by shining your bike up and entering it in the show between 10am and 12:30pm for only $10. Photo courtesy of Star Chapter 146.